My freelancing father counseled me on my writing ambitions from early childhood, while my editor mother marked up every letter I mailed home from camp through college. I graduated from Indiana University in 1980 with a Journalism degree and moved to Madison, Wisconsin, my home ever since. I did, and that was a good decision. But the meantime is over. It’s time to become the writer I was born to be. It all started when I bought a ticket to England last summer to attend the “Global Reflections on Narrative” conference at Mansfield College, Oxford. “This is going to be life-changing in some way, if I’m open to it,” I thought as I clicked “purchase” on Orbitz that day. 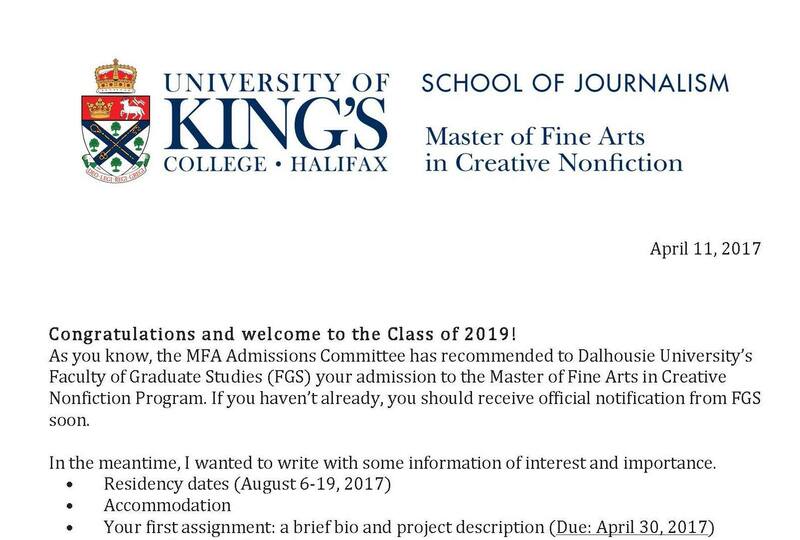 For a couple of years I’ve been growing increasingly intrigued by the idea of pursuing more education in writing creative nonfiction, and yearning for a recognized academic credential. But I never met an MFA program I wanted to be part of. They were all born out of a fiction or poetry program, or they were as obscure as “personal history”, and I needed another obscure affiliation like a hole in the head. (“Transformational Language Arts?” Sounds groovy, but who gets paid for doing that, exactly?) Besides, I needed something low- or no-residency. So many programs required more than I could give while working for my living. Then I met Dean Jobbs, faculty at University of King’s College in Halifax, Nova Scotia, a fellow attendee at the Oxford conference. He slipped me a little brochure. “We’ve got your book,” it promised. Conversations ensued. I began to flirt with the idea… could I? Should I? The flirting became dating. We had our first sleepover last November in Toronto, when I went to a meet-and-greet for potential students. “Could I?” became “Would I?” Writing the application letter, culling the portfolio for writing samples, sending away for the transcripts from my extremely checkered academic career… (Want a great memory prompt? Get your college transcripts. ), seeking letters of recommendation… the packet was complete and submitted in December 2016. Now it’s official. I’m in an LTR with my MFA. And the work has begun! I have books to read, essays to write, before I arrive for residency in Halifax in August. 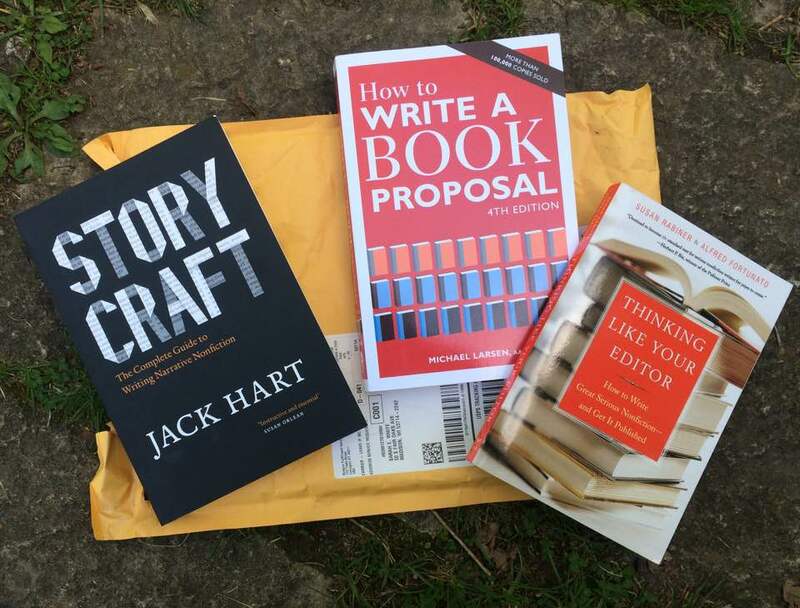 Stay tuned: next week I’ll review Storycraft by Jack Hart. Stories from my MFA experience will appear occasionally here on True Stories Well Told. Let’s do this together! Good for you Sarah!! I’m looking forward to following your progress via TSWT as you continue to craft your story by living a life well lived. Congratulations on living the dream, Sarah, a wonderfully introduced story. Can’t wait to read what you write out of this inspiration and study.